Off the beaten path takes us to places in cities that are out of the way and outside of your normal tourist or visitor areas. To make this a challenge, I chose Newport Beach for this first installment as I had spent many years growing up in or near this harbor town. 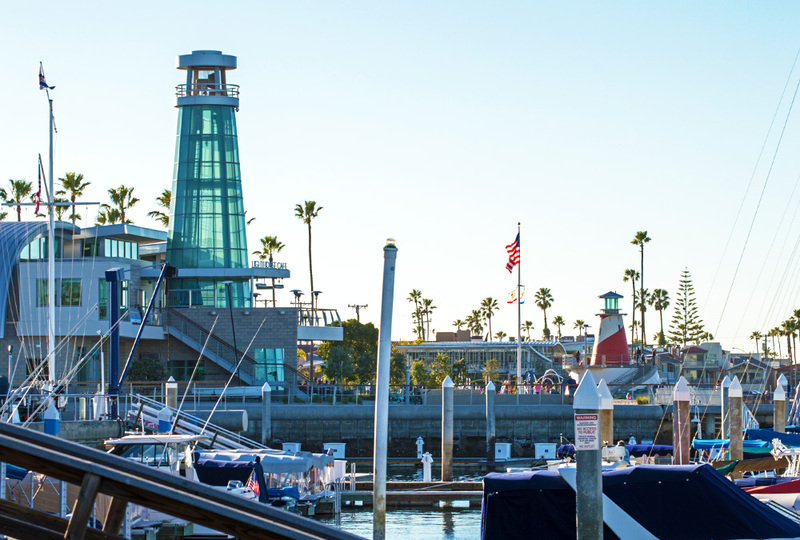 When people think of Newport Beach, they think of the harbor, the beach, the pier, Fashion Island, the Pavilion, and Balboa Island. So I found a few spots that were as the title says, off the beaten path. On this beautiful sunny day in January, we were headed up the coast to Lido Isle, the old cannery, 15th street, and Marina Park. Spending many hours in Newport Beach, I explored every nook and cranny either by car, bike, or boat so I didn’t think it would be possible to find a place that I haven’t seen in this area. For this outing, I brought a friend who also grew up in this area, so we were both excited to investigate these hidden areas to see if they have changed through the years. As Newport Blvd leads you into the Balboa Peninsula, you will catch your first glance of the harbor to your left and the entrance to Lido Isle shortly after. 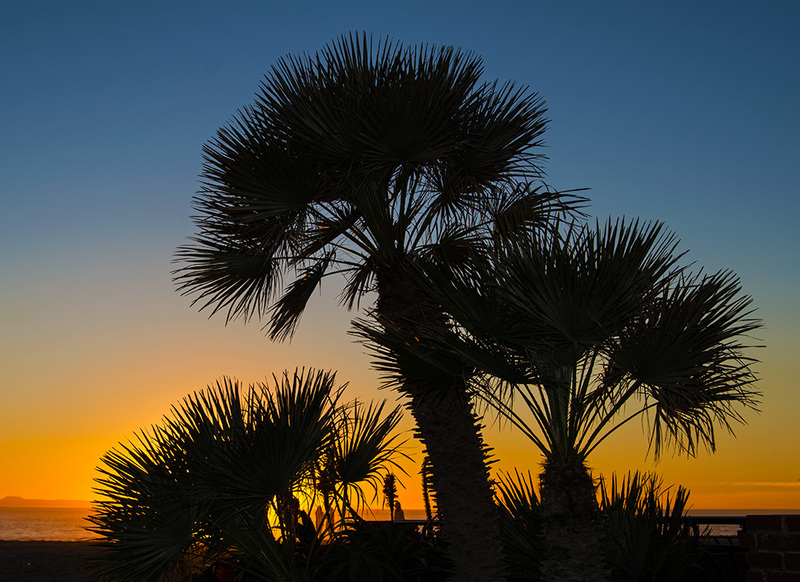 Lido Isle is a man-made island that is rich with history in Newport Beach. As you first enter the area, you are greeted by the long standing and historical Lido Theater which has been showing films since 1939 and happily has not changed much through the years. There are not too many theaters that show just one movie and The Lido is one of them. No multiple screens here, for the Lido, it is just the one…like the old days. Across the street, is a brick laden road that is part of the Cape Cod themed Lido Marina Village. With its recent makeover you will discover, various types of shops, high end fashion stores, and bay front restaurants. The areas sophisticated clothing shops are a favorite of the Real Housewives of Orange County, or so I was told. True or not, it did look like a place you could pick up an expensive outfit or two and some fancy accessories. For me though, I prefer Jacks Surf Shop down the road for my high end fashion of sandals, shorts, and t’s. Just a bit up the street, we parked near the Western Canners Co. Restaurant and walked around for about an hour. I snapped some shots and was told to stop shooting by one of the attendants in the parking lot. Surprised, I looked at him only to be told that as a famous movie star he didn’t like his picture taken. Oh, it was just a joke, I laughed and he smiled back. Glad it wasn’t stuffy around there especially since I was standing right next to a shiny new Rolls Royce. Maybe there was a real star eating lunch inside, but then again probably not since I was the only thing that remotely resembled paparazzi. 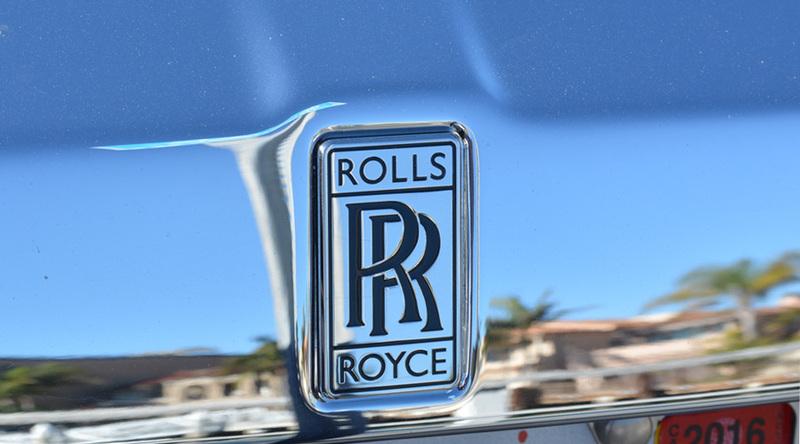 The reflection in this Rolls Royce shows the nice homes lining the marina. Also, with all that money, why can’t you update your registration? Off the beaten path, you can still get to the restaurant by car, bike, or boat! 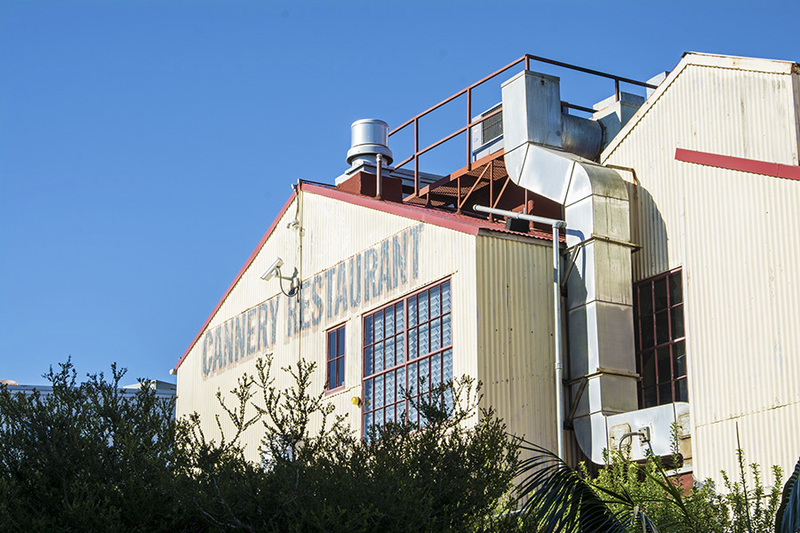 The restaurant sits in an area appropriately called Cannery Village. 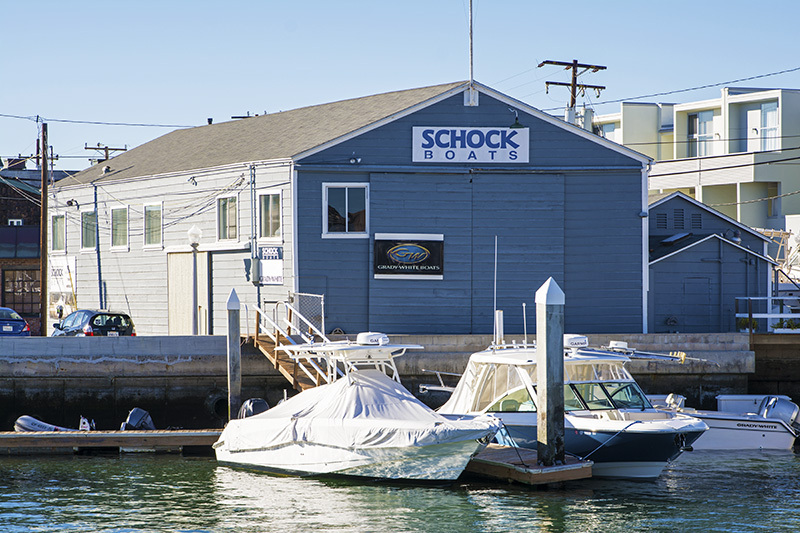 These 40 acres of the Balboa Peninsula were once the center of a thriving fishing industry. 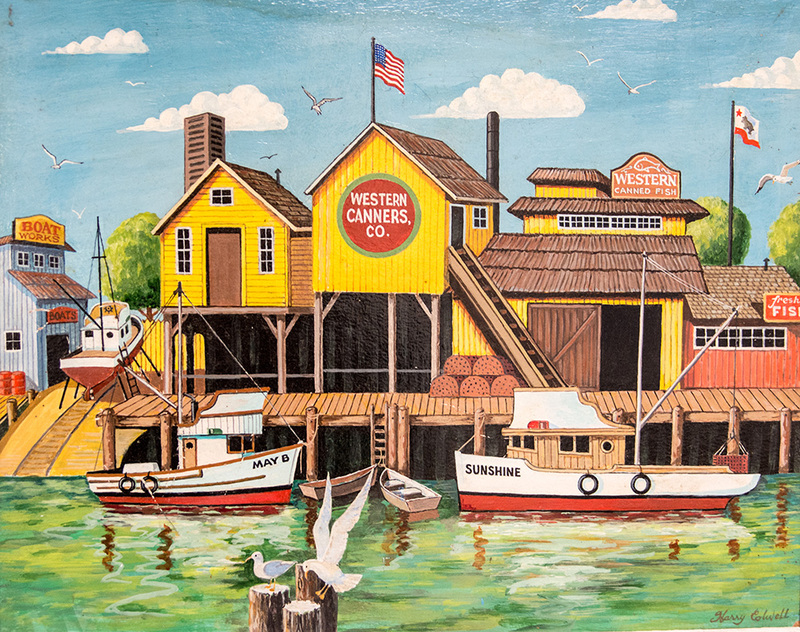 The actual cannery was an active business surrounded by boat yards, conveyor belts, fishing boats, and the smell of fresh catch. Updated boat yards are still present today which kind of give you a glimpse of the past, but the nearby modernistic and industrial looking condos bring you right back to 2017. 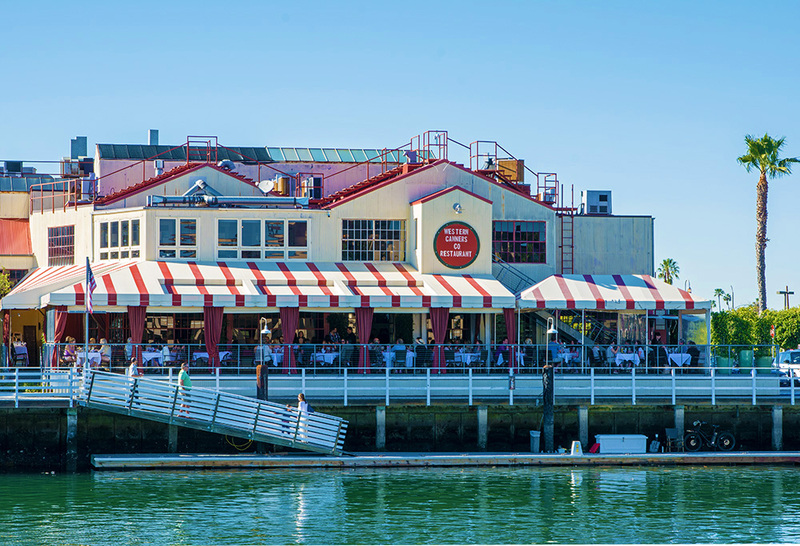 The new restaurant was preserved to still look like the old cannery and from what I can remember; it is the same exact color. My Dad painted a picture in the 70’s and although the colors are more vibrant in his oil painting, it is still the same color scheme on the building and all of the signs. Although a lot more vibrant, my Dads painting from the 70’s show the same color scheme as the new restaurant. 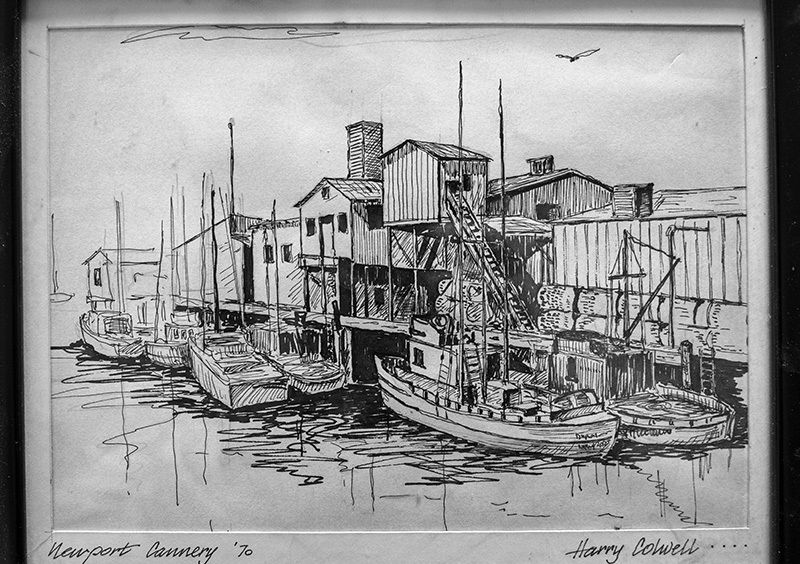 Also the old cannery in black and white. 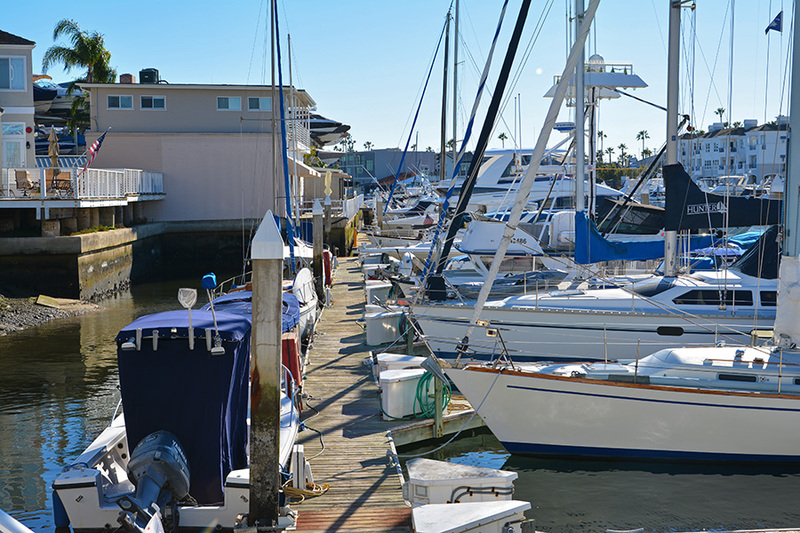 Across the small marina area stands another staple of Newport Beach, the Bluewater Grill. When I was younger it was called the Sea Shanty and I always loved its nautical motif and windows that looked out at the bay. For us, it was a fancy place to eat, although I could never be talked out of anything other than a cheese burger. Tucked away in the corner of a small inlet of the larger harbor, the restaurant has casual dining and a large patio that sits right at water’s edge. This is not a place near a main street or touristy area, so seeing it packed with diners on this warm weekend day says a lot about the food and the ambience. On our way back to the car, I glanced at their food choices and was happy to see that they still have my beloved cheese burger on the menu!! The former Sea Shanty, now the Bluegrill Cafe and nearby channel. We drove around and admired the beautiful waterfront homes with their docks showing off every size boat and water craft imaginable. We all agreed that we could easily live there although the parking situation left little room to have any of our friends or family over for a visit. Leaving Lido, we headed further into the peninsula to 15th St. which is a short street tucked away right off the main boulevard. I have driven by it many times and had only stopped a few times to pick up a quick item at the tiny corner store. Since we were looking for out-of-the-way places, we decided to park and see what else was on this little street. Luckily for us a parking space opened up which was quite a surprise considering there were only eight spots. The ocean side of 15th Street is only about a half a block long and features the abovementioned corner store, a surf shop, and a café. 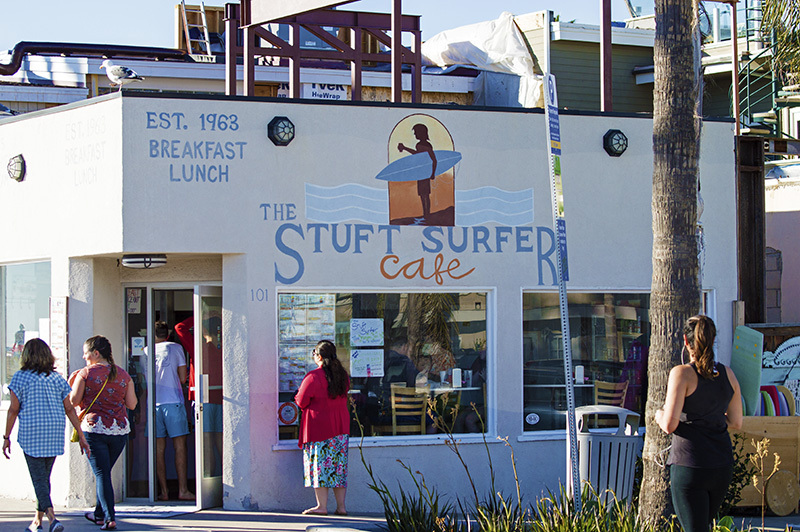 The Stuft Shirt Café sits directly near the cement boardwalk overlooking the ocean. Picnic tables were set up on the beach and I thought how nice it would be to wiggle my bare feet in the sand while enjoying a nice breakfast or lunch. It doesn’t get much closer to beach front dining than this! As it turns out, this café had been there for over 50 years and we were surprised that we didn’t know it existed! As I mentioned, I have driven by so many times! 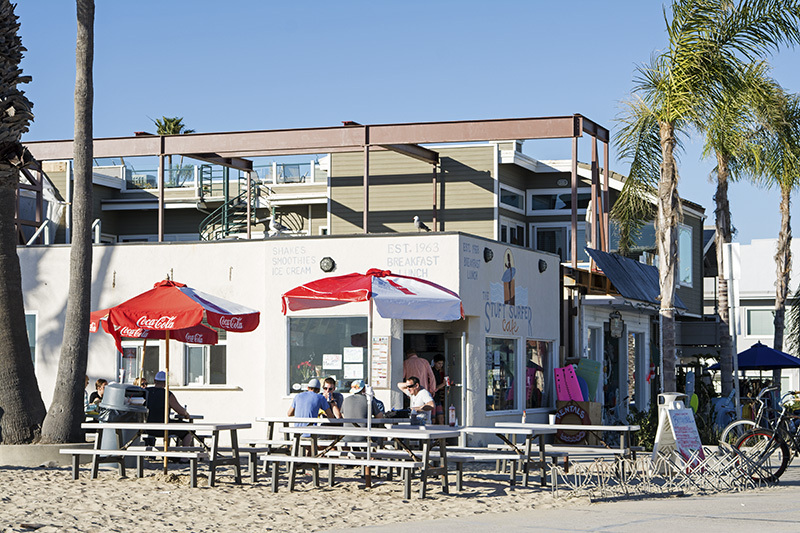 This truly “off the beaten path” oceanfront café specializes in breakfast and lunch and is open in winter and summer. We were told by a local that it will be soon renovated, so once it is done, I am definitely going back. The nice part about the peninsula is that you can be at the beach one minute and just a short walk across the boulevard; you can be at the bay. On the bay side you are greeted with a plethora of boats and docks, and a view of all of the water front homes. 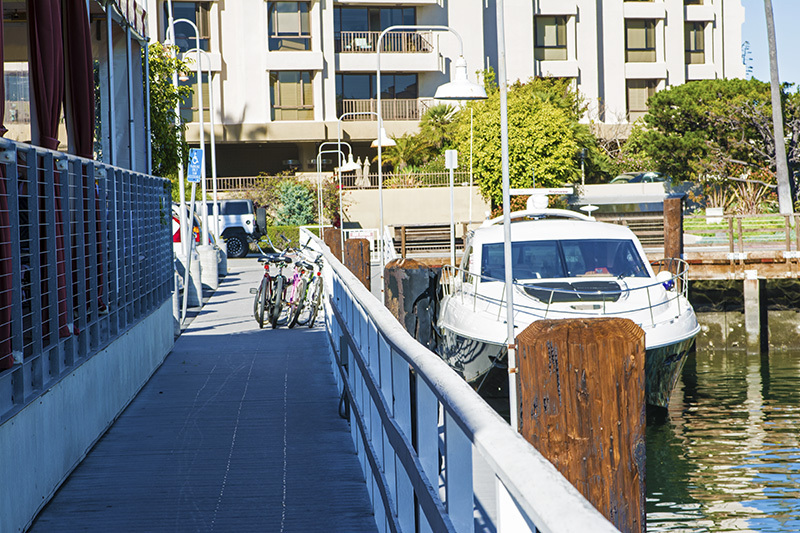 A public dock allows you to fish, moor and launch your boats, kayaks, or stand up paddle boards. Sitting on the dock ramp you can see all the way to the new Marina Park featuring a great kids area and the Lighthouse Café . The park was jamming with kids and adults alike. There were play areas with slides and climbing obstacles plus a nifty lighthouse right in the middle. Watch out for weekends and summer as I am sure parking is scarce even though it looked like there was plenty of parking from our view from the road. 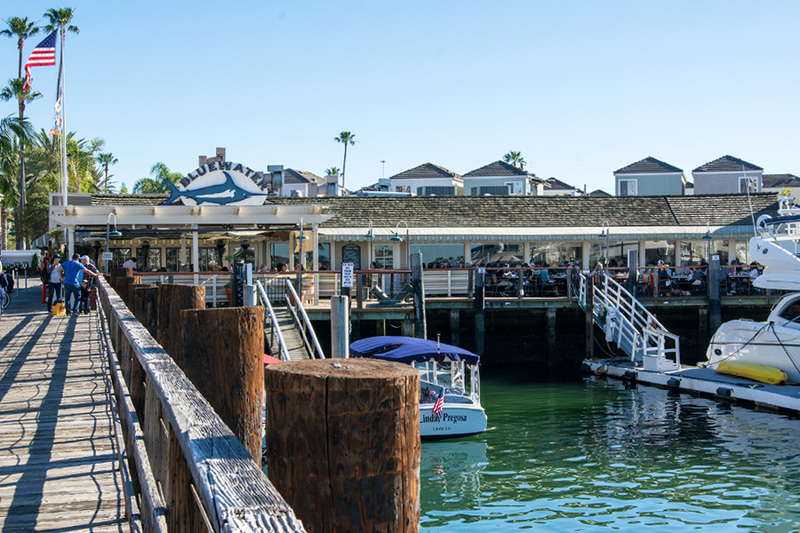 Nearby, the Lighthouse Café is yet another great eating establishment in Newport Harbor and is shaped as its name implies, like a lighthouse. The restaurant is open for breakfast through dinner and houses about 65 people with a great view of the harbor. You could easily stroll around this area for hours spending time enjoying the bay, people watching, picnicking, or just chillin’ with a good book in hand. Although numerous restaurants were mentioned in this story, we didn’t eat at any of them. We just enjoyed each area for what it was. At Lido, the history was still alive as the city didn’t forget about the old days of the bustling fishing industry. Over the bridge, old money still thrives but has cohesively shared its space with the new contemporary look of today. 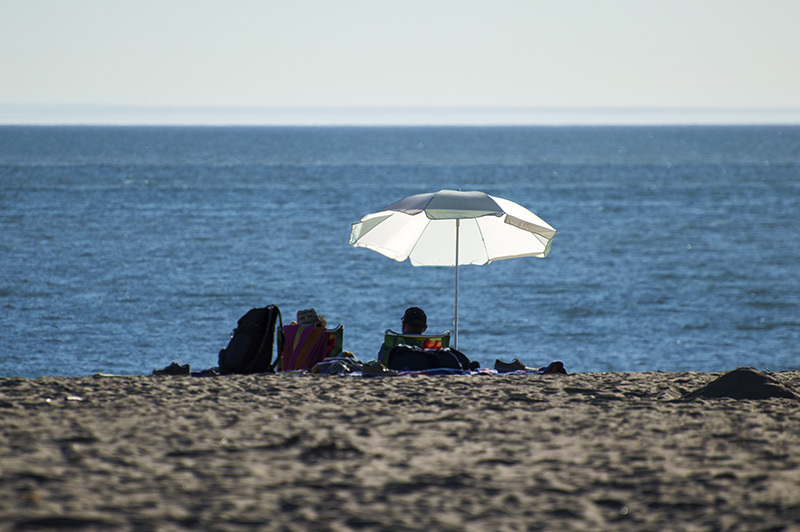 Far away from the ritzy Lido Isle, the down-to-earth 15th Street is filled with a simpler life with bicycles leisurely gliding by on the boardwalk, waves crashing on the shore, and picnic tables lining the sand. Close by, the Marina Park was all about enjoying the sunshine, playing in the park, building castles in the sand, or eating at in the eclectic Lighthouse Café. It was a fun day for us former locals to go down memory lane and reconnect with some out of the out-of- the-way spots we once knew. It was nice to see if they had changed after all of those years, surprisingly some had and some hadn’t. Some we discovered for the first time! 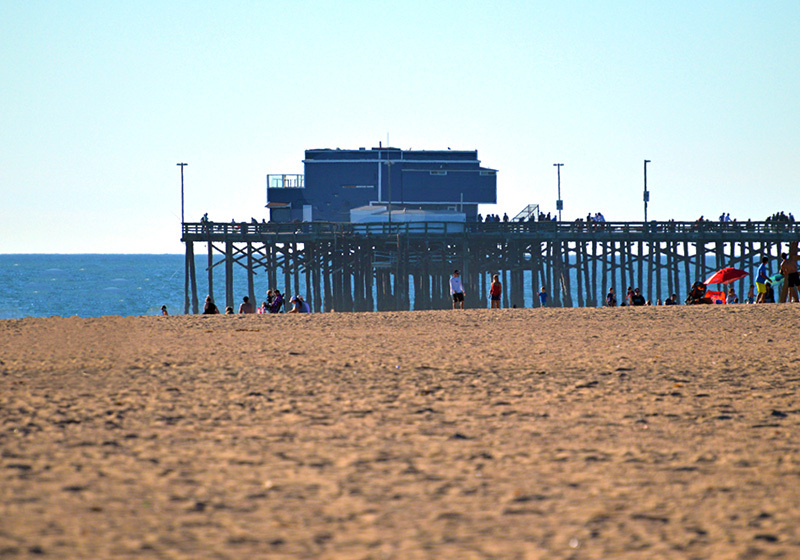 As the day was drawing to a close, my feet were propped in the sand at 15th Street and I could see the more popular Newport Pier in the distance. With all of its shops, restaurants, and bars, I knew from experience that it would be far busier and crowded than where I was standing at that moment. I don’t mind crowds or the hustle bustle, but for today I was happy being right where I was…off the beaten path. Life on the peninsula. 70 degrees in January. Thanks Debs for beautiful words and pictures where we spent a lot time and cherished memories.